This work was sponsored by The Alma Mater Society of UBC, The Chinese Student and Scholar Association of UBC, and The Vancouver Society in Support of Democratic Movement in 1990 who proposed to recreate at UBC the symbol of democracy, which was crushed by Chinese tanks in the early morning hours of June 4th, 1989 in Tiananmen Square. The statue is a replica of the existing figure constructed by Thomas Marsh of San Francisco. This statue is made of an epoxy and white marble dust mixture. It was cast from a fiberglass mould and located at the SUB Plaza. The face and arms are polished smooth to contrast to the rough finish of the rest of the sculpture. Located on the exterior wall of the Buchanan Building entrance, the completion of this sculpture in 1961 was made possible by a $2000 Canada Council grant. The patina on the surface is the result of weathering. It is made of welded and soldered sheet copper. The work was previously misidentified as Configuration. However, Configuration was a different abstract sculpture by Class in local red stone, commissioned to mark the opening of the Buchanan Building in 1958. It was later vandalized and eventually removed from display. Class was born in Germany in 1924 and died in 1997. He attended the School of Art in Strasbourg, the School for Granite Sculpture in Wunsledel, and the State Academy of Fine Arts in Germany. He also attended the Instituto de Allende in San Miguel, Mexico. Class arrived in Canada in 1951 where he taught sculpture in his studio and at the Vancouver School of Art. From 1967 and on Class also taught at UBC and the Emily Carr Institute of Art and Design. Class completed many large commissions in Vancouver and Victoria. Located in front of the main entrance of the Music Building, this sculpture was donated to UBC by Alfred Blondell in 1968. Chosen by a jury in a closed competition. Located near the north side of the Lasserre Building, Three Forms won the UBC Purchase Prize in the first Outdoor Sculpture Show held at UBC in 1956. Clothier was born in Prince Rupert in 1921. He attended St. George's School in Vancouver and then UBC in the late 1940s. He attended the Royal Academy of Dramatic Arts in London and is known for his role as "Relic" in the CBC television series The Beachcombers. As a sculptor, Clothier had his first exhibition at UBC in 1956 when he won first place for Three Forms in a contest judged by Herbert Read. He also exhibited in Art Encounter '82 in Vancouver and was a member of the Pacific Northwest Society of Sculptors. 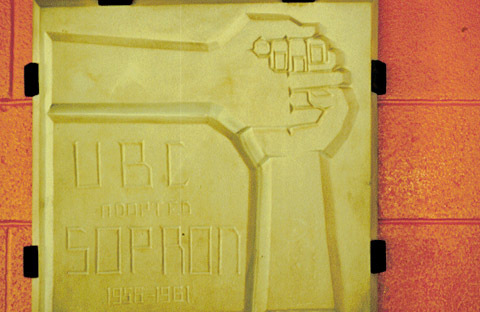 Located on the exterior of the north wall of the Scarfe building entrance, this wall relief was commissioned and purchased by UBC for the opening of the new Education building. Deggan was born in Britain and educated at the Kingston School of Art, the Chichester School of Art and the Worthing College of Arts and Crafts in Britain. He moved to Canada in 1957 and taught at the Vancouver School of Art and Capilano College. A replica was made in 1977 by Gerhard Class. Made of marble sand and polyester resin it is now located at the north end of the covered walkway between the Music Building and Lasserre. It was donated to UBC by Mrs. Astrid Fischer-Credo and exhibited on the UBC campus as part of an exhibition of outdoor sculpture organized by the Northwest Institute of Sculptors. Fischer-Credo was born in Berlin in 1890 and died in Vancouver in 1959. He studied at the Akademie der Kunste in Berlin from 1908-15 and the Royal Academy of Art in Paris from 1919-21. Fischer-Credo lived in the Philippines, Mexico, Cuba and the United States before coming to Vancouver in 1957. His first solo show was in Manila in 1926. A major commission in Vancouver includes a life-size crucifix in yellow cedar for Our Lady of Sorrow Church at Little Flower Academy. 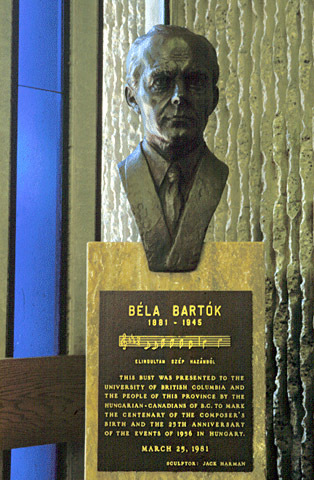 Located inside the lobby of the Music Building; this sculpture was presented to UBC and the people of British Columbia by the Hungarian-Canadians of B.C. to mark the centenary of the composer's birth and the twenty-fifth Anniversary of the Hungarian Revolution. Harman was born in 1927 in Vancouver and studied at the Vancouver School of Art and the Slade School in London from 1952-53. Returning to Canada, Harman worked as an advertising artist in Toronto and Vancouver. 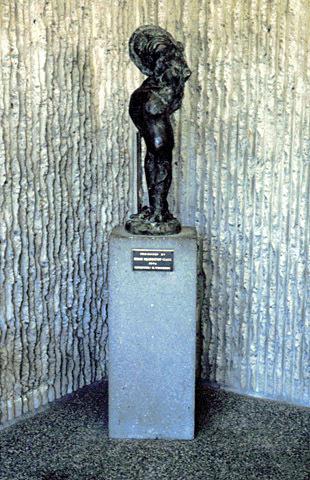 In 1955, Harman began to sculpt in bronze using a welding torch. His first solo show was held at the Vancouver Art Gallery in 1962. Located between Lasserre and Frederic Wood Theatre, this work was a donated to UBC in 1976 by the Alumni Association. Located at the south east corner of the Thea Koerner Student Centre on Crescent Road. The University of British Columbia chose this fountain design from five submissions. The sculpture was cast in Harman's North Vancouver foundry. The four figures face the respective points of the compass. 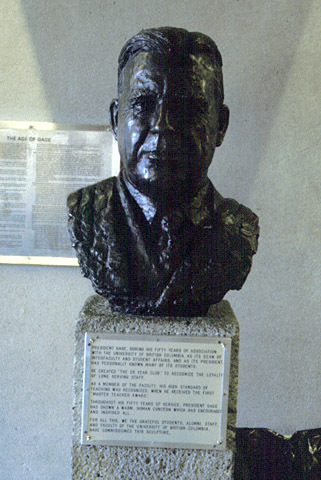 Located in the main foyer of the Gage Residences, this portrait bust was a bequest to UBC in commemoration of Walter Gage's fifty years of service to the university. 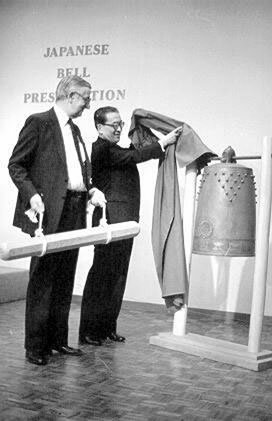 The Pacific Bell was cast by Japanese Master Craftsman Masahiko Katori. Presented to UBC in 1983, the bell is inscribed with five characters which may be translated as, "a clear mind leads to tranquil thoughts." Katori received many honours for his skill in casting metal, including designation by the Government of Japan as a "Living National Treasure", a rare title bestowed upon Japanese artisans for their skill in traditional crafts. 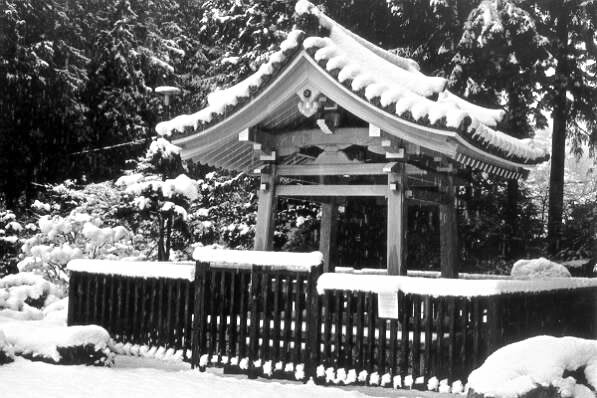 The Pacific Bell is housed in a traditional Japanese bell tower crafted of yellow cedar dedicated by Japan's Prime Minister Yasuhiro Nakasone in 1986. Yellow cedar is similar to Japanese hinoki, traditionally used in the construction of temples and bell towers. Pre-fabricated in Japan and re-assembled at UBC, the tower - with the exception of the eaves and the roof - is held together without a single nail. A ceramic tile roof was chosen over wooden shingles for reasons of resonance. The significance of the bell tower lies in the bell itself. In ancient times, the bell was used to sound the hours of the day. In Buddhist temples, the fading sounds of the bell serve to remind one of the transitory nature of life. The ringing of the bell on New Year's Eve also has a special significance. As the late Dr. Shotaro Iida, a UBC professor of religious studies explained: "In Buddhist philosophy, there are 108 mental defilements. It is believed that by ringing the bell 108 times on New Year's Eve - 54 times before midnight, 54 times after - one can erase the past mental impurities and start the year new." Located atop the supporting poles of the Thunderbird Stadium, these sculptures were commissioned by UBC. They enhance the architectural concept and expose the function at the stadium through an aggressive aesthetic symbolism of the "team spirit." Kujundzic was born in 1920 in Yugoslavia and was educated at the University of Budapest. He painted in Scotland from 1946 to 1956 and then moved to Cranbrook, B.C. in 1958. He painted among the First Nations people of the Kootenay region. The use of Northwest Coast Motifs in Thunderbirds reflects this influence. Kujundzic then moved to the United States where he was appointed Head of Pennsylvania State University's Fine Arts Department from 1968-69. Located in a glass cabinet in the foyer of the Hennings Building, this glass sculpture was presented to the Physics Department by Mrs. D.T. Lees in 1976. Lees worked in the Physics Department at UBC as a glass blower from 1949 to 1976. He participated in the exhibition called Glass 1959 as the only Canadian entry. His work is now on permanent display at the Corning Glass Centre in Corning New York. Located in between Lasserre and Frederic Wood Theatre, this sculpture was donated to UBC by Transport Canada in 1995. Murray was born in Vancouver in 1936 and raised in Saskatoon. He attended the University of Saskatchewan School of Art from 1955 to 1958 where he studied painting. He is well known in Canada and the United States for his large non-representational painted steel and aluminium sculptures. His sculptures begin with sketches, which evolve into shop drawings that can be understood by industrial metal fabricators. Many of his sculptures are large outdoor pieces, which have been commissioned or purchased for public spaces. Murray's early training as a painter is evident in the attention he pays to the surface of the sculptures and his use of colours. The viewer must physically walk around the work to see the different aspects of the sculpture which change dramatically from each angle of view. Cumbria represents the first large-scale public sculpture installed at UBC in twenty years. The sculpture was first exhibited on the plaza of Toronto's City Hall in Sculpture '67. It was then shown at the Art Gallery of Ontario and then at Battery Park in New York City. In 1969, the Ministry of Transport purchased Cumbria for display at the newly opened Vancouver International Airport Terminal. 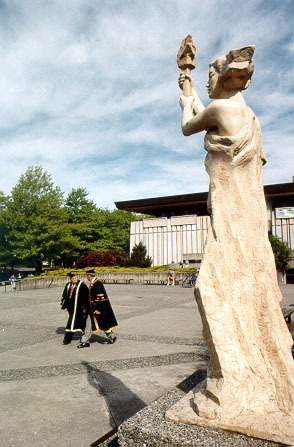 In 1995, the airport removed the sculpture, which was then relocated to UBC. 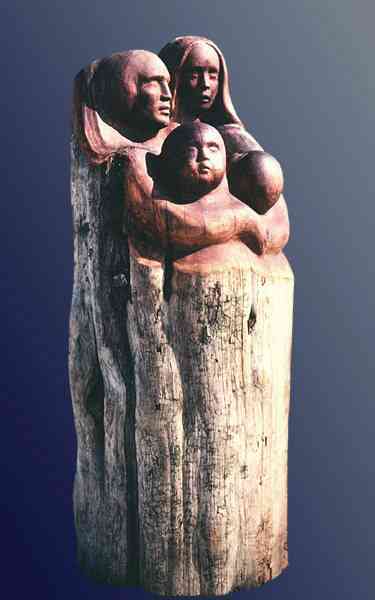 Located outside the SUB near the North Parkade, this totem was purchased by the AMS in 1948. The pole was previously located in front of Brock Hall. The pole faces the ocean with its back to the main entrance of the SUB in keeping with the Northwest Coast First Nations tradition of placing poles between the longhouse and the sea. The pole tells of the five tests of Tsikumin, chief shaman of the Red Cedar Bark Dance and founder of Qui-Owa Sutinuk, ancestors of the carver. The Red Cedar Bark Dance was performed in Kitsilano Park during Vancouver's Jubilee in 1936. Over time, the original pole deteriorated due to weathering and vandalism, and was replaced in 2004 . Neel was an artist and carver from Alert Bay on Vancouver Island and the granddaughter of Charlie James. James was also a Kwakwaka'wakw carver who carved the houseposts in Stanley Park. Neel helped to revive the art of carving among the Kwakwaka'wakw. Ceres First Taught to Plow the Land when Acorns and Strawberries Failed, n.d. Located along the entire wall of the Faculty Room in the Agriculture Building, this wall sculpture was presented to UBC by Dean and Mrs. Blythe Eagles. Norris is a local sculptor and graphic artist who was educated at the Vancouver School of Art, Syracuse University and in London. Norris taught at the Vancouver School of Art as well as night classes at the UBCs Extension Department. Located between the Main Library and the Hennings Building, Mother and Child was given to UBC by an anonymous donor in 1957. This work was originally intended for the entrance of the new Education Building along with a work entitled Father and Child. However, the building was not finished until ten years after the commission and Father and Child was never completed. This sculpture is located in front of the MacMillan Building in the Forestry and Agricultural quadrangle. Dean Blythe Eagles donated it as a memorial to his parents, who were pioneers in the settlement of British Columbia, and to all of those who have labored to improve our agriculture. 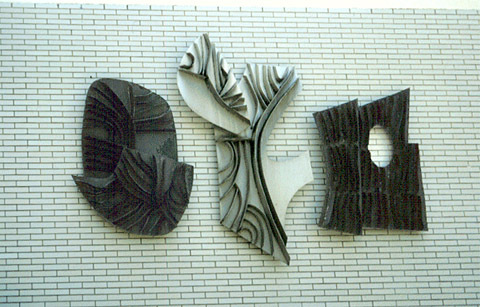 Located on the exterior entrance wall to the Metallurgy Building, the wall sculpture was commissioned by UBC for the new Metallurgy Building in 1968. The architects asked Norris to design a wall that would accentuate the entrance that was otherwise difficult to locate. The mosaic consists of an abstract of hexagonal symmetry, characteristic of many metals. Pressing metallic components into the brick before firing formed some of the bricks. Located on the fourth floor of the Frederic Lasserre Building, the sculpture was donated to UBC by Rothman's of Pall Mall in 1967. Florentine Doors #2 was exhibited in the Centennial Sculpture '67 in 1967. Perry was born in Vancouver in 1923 and educated at the Central School of Arts in London, the University of British Columbia and in Florence. Perry's first solo exhibition was held at the Griffiths Gallery in Vancouver. He specializes in sculptures of anthropomorphic bird forms and has received various commissions in Western Canada including the Burnaby Municipal Hall in 1958 and the Vancouver Playhouse Theatre in 1967. Located on the fourth floor of the Library Processing Building, this sculpture was donated to UBC by the Government of Canada Center for the Human Development Department of Public Works in 1976. Schmerholz was born in Rumania in 1949 and spent two years studying engineering and design at the University of Cluj in Transylvania. He began to carve wood at age nineteen and was influenced by the unfinished sculptures of Michelangelo on a trip he took to Italy. In 1970, he went to Sweden where he had his first exhibition. In 1972, he came to Canada and lived in Toronto before moving to Vancouver. In 1975, he exhibited at the opening of the Unicorn Gallery in Vancouver. His sculptures frequently make use of driftwood. Located in the exterior wall of the Main Library's front entrance, this wall relief includes the UBC crest, floral emblems and a horse and rider. The work is a reminder of the famous "monkey trial" of 1925 involving John Scopes, a teacher from Tennessee. Scopes taught the biological history of evolution in defiance of a State law prohibiting the teaching of doctrines contrary to the Bible. As a result, he was put on trial which became known as the "monkey trial" because a religious group tried to ridicule the followers of Charles Darwin. Scopes was found guilty and fined $100. Monkey and the Bearded Man was a gift to UBC by the artist. Sharp was born in 1880 and educated in England. After moving to Canada he became an original member of the Vancouver town planning commission and a founding partner of Thompson, Berwick, Pratt and Partners, the designers of many original buildings on the UBC campus. Being an architect, town planner and painter, Sharps many commissions include the Victory Square Cenotaph, St. Johns Hospital, and UBC buildings like the Main Library. Located on the exterior south wall of St. Mark's College, this wall sculpture was commissioned by the architects Gardiner, Thornton, Gathe and Associates. The lion is the symbol of the evangelist St. Mark. The sculpture was intended to reflect the afternoon sun in order to create shadow effects. Thomas was born in Toronto in 1915. 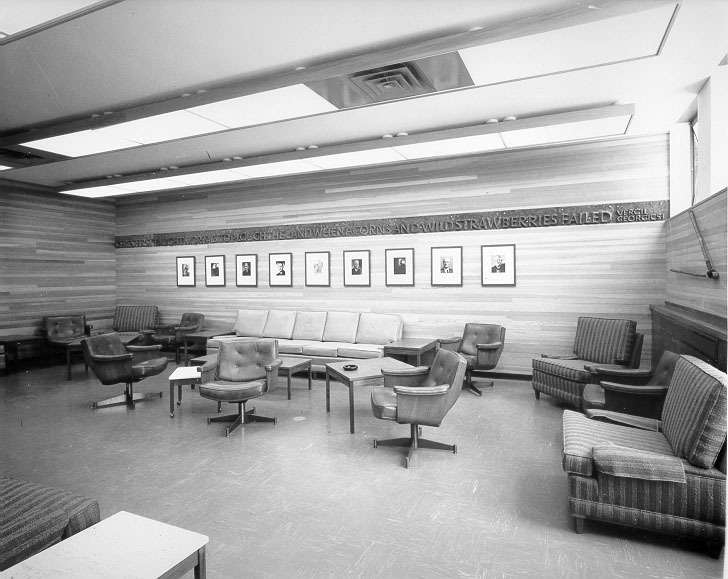 He was on the UBC Faculty from 1950-80 in both the Fine Arts and Architecture Departments. He painted until 1956 and then started creating murals and sculptures. He produced paintings, etchings, drawings, mosaic murals and sculptures. Located on the exterior of the Brock Hall Annex entrance, this mosaic was commissioned by UBC for the new wing of Brock Hall in 1958. Symbols for Education represents by means of various symbols, the various faculties and departments of the university. 38" x 14.5" x 16.5"
Located in the lobby of the Music Building, this sculpture was presented to UBC by the Music Graduating Class in 1974. Vicenzi was born in 1949 and is a Vancouver sculptor who was educated in bronze casting at the Vancouver School of Art. Located on the exterior wall of the south entrance of the MacDonald Building, this wall mural was presented to UBC by the Vancouver Chapter of the Alpha Omega Fraternity in 1971. Weghsteen was born in Belgium in 1929 and established himself as a ceramic artist and muralist after he moved to Vancouver. He was president of the British Columbia Potters and Guild and taught at the Vancouver School of Art. 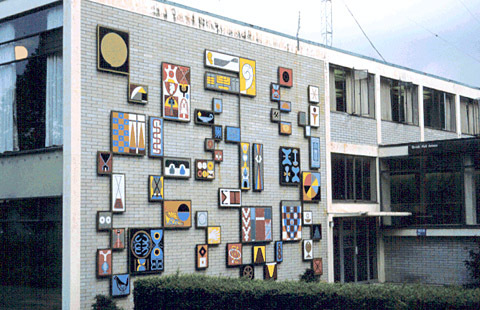 He had numerous commissions including the Nanaimo Hospital mural in 1966 and the Vancouver International Airport brick core mural in 1969. Located outside of main entrance to the Woodward Bio-Medical Library, this sculpture was donated to UBC by the Vancouver Branch of the War Amps of Canada and the Woodward Foundation. It was unveiled by the Lieutenant-Governor in 1958. This sculpture is a replica of the one on The Mall leading up to Buckingham Palace in London. Wheeler was an English sculptor who was represented by the Tate Gallery in London. He is known for producing memorial monuments and statues. Germain Bergeron was born in Ste. Perpetue, Quebec in 1933. Artist was commissioned to create these works for the House of Seagram art collection for Expo 67. They were again exhibited at "Man and His World" in 1968. The three figures were created from miscellaneous machinery parts. Following the "Man and His World" exhibition the House of Seagram art collection was dispersed amongst Canadian universities and these figures came to UBC. Formerly located outside the Frederic Wood Theatre. Sculpture of BC gold miner originally located in the Buchanan building quadrangle. After being vandalized on several occasions it was finally deemed to be a safety hazard and removed. Jan Zach was born in Czechoslovakia in 1914. Formerly located outside of the Lasserre building, this small sandstone sculpture was presented to Walter Koerner who, in turn, presented it on permanent loan to the University. Formerly located on the second floor of International House, this work was commissioned by a group of Hungarian-Canadians from the area of Sopron in Hungary and donated to UBC by the artist in 1961. The relief depicts a pair of hands linked in friendship. Apt was born in Hungary in 1934 and came to Vancouver in 1957 with 189 other students from the School of Forestry at Sopron University in Hungary after the 1956 Hungarian Revolution. The Sopron School of Forestry was then re-established at UBC. Apt changed his focus from forestry to art at UBC between 1957-61. Formerly located in the main foyer of International House, this sculpture was purchased by UBC as part of the University Purchase Prize. It won the UBC Provincial Competition in 1958. Carlson was born in Bella Coola in 1910 and died in 1986. Carlson's occupation was as an economist but he did take some classes with sculptor Jan Zach in Victoria. He exhibited his sculpture and jewellery in several shows in Victoria and the Portland Art Museum in 1958.